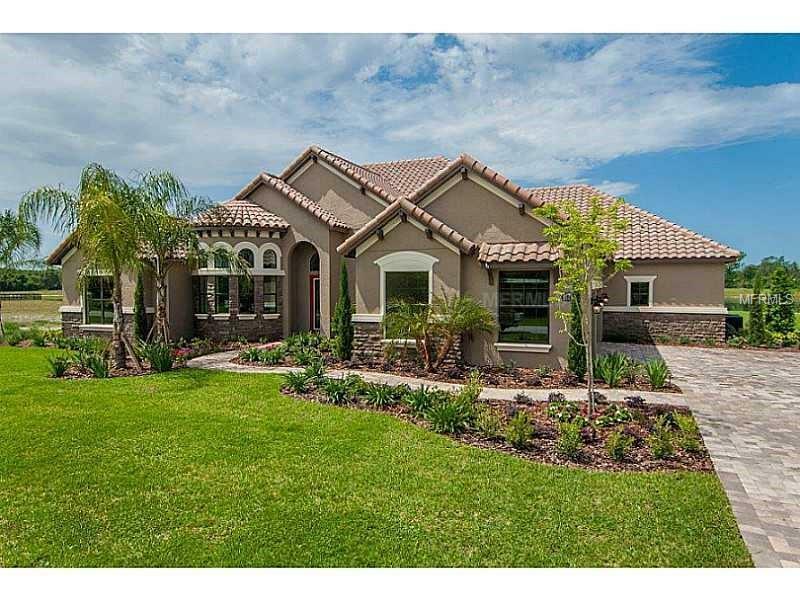 BEAUTIFUL, 1 STORY, 4 BEDROOM, 3.5 BATHROOMS, 1/2 POOL BATH, WITH AN INCREDIBLE MEDIA, GAME, AND CARD ROOM, 3 CAR GARAGE, MEDITERRANEAN STYLE POOL HOME LOCATED IN THE LUXURY COMMUNITY OF BELLANONA ESTATES. NO CDD TAXES. 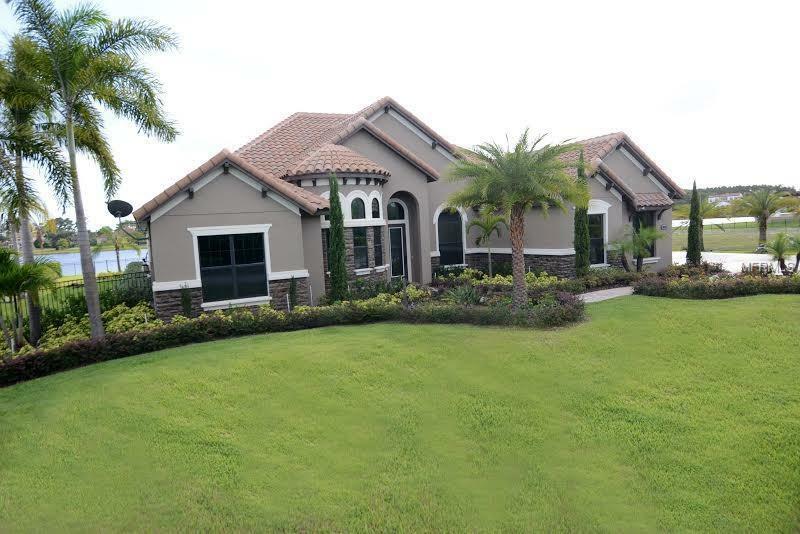 THIS BEAUTY BOASTS 3,761 SQ FT. THE KITCHEN OFFERS KITCHEN-AID BUILT-IN STAINLESS STEEL APPLIANCES, WALK-IN PANTRY, GRANITE COUNTERTOPS THROUGHOUT AND A BREAKFAST BAR THAT PROVIDES ADDITIONAL EATING SPACE. ALONG WITH A SEPARATE DINETTE, AND FORMAL DINING ROOM THE MAIN FAMILY ROOM IS A COMPLETE OPEN FLOOR PLAN. THERE IS A LUXURY STUDY THAT WILL SUIT THE NEEDS OF ANY PROFESSIONAL OF ALL AGES. THE COMBINED GAME, CARD, AND MEDIA ROOM IS THE STAR OF THE HOME. THIS GRAND ROOM WITH DARK HARDWOOD FLOORS, COMES FULLY EQUIPPED WITH A GENEROUS SIZE WET BAR, WINE REFRIGERATOR, AND A SURROUND SYSTEM THAT FLOWS OUT TO THE POOL/LANAI AREA. THE MASTER SUITE HAS A VIEW OF THE LAKE AND POND, AS WELL AS OFFERS A LUXURY BATH/SPA WITH A SEPERATE GRAND WALK IN FRAMELESS SHOWER AND GARDEN TUB. ALL CABINETS IN THE HOME ARE HAND MADE AND THERE IS EXTENSIVE TILE, TRIM, AND DETAIL THROUGHOUT THE ENTIRE HOME. RELAX OUTSIDE ON THE LARGE LANAI IN FRONT OF YOUR GAS POWERED FIRE PIT, WHILE COOKING DINNER IN YOUR OUTDOOR SUMMER KITCHEN, ALL WHILE TAKING IN THE VIEW OF THE LAKE.THIS PROPERTY IS CONVENIENTLY LOCATED LESS THEN A MILE FROM LAKE NONA'S NEWEST SHOPPING CENTER WHICH FEATURES WALMART SUPERCENTER, LOWE'S, SAM'S CLUB AND MUCH MORE. 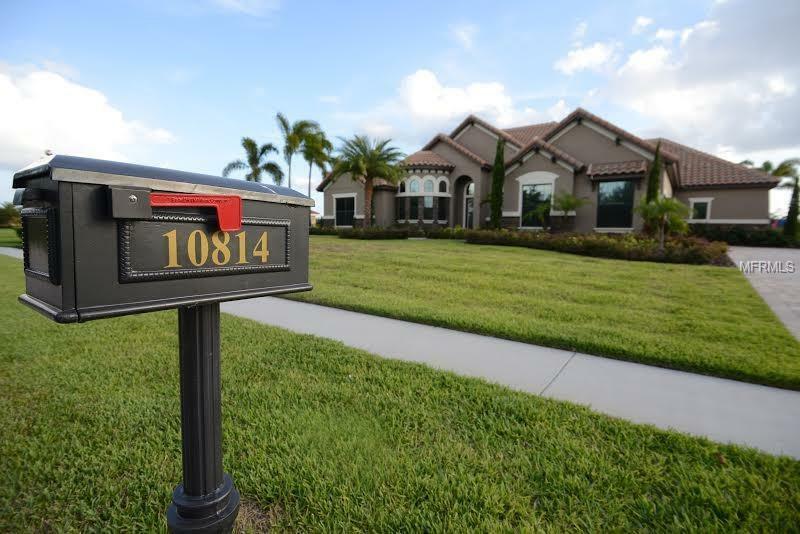 QUICK ACCESS TO MAJOR HIGHWAYS SR 417,SR 528, AND MINUTES FROM ORLANDO AIRPORT.